In this article, I will explain the use of the Ranking function in Microsoft SQL Server. In common use, Rank shows the position and courage of a person in a real life scenario. So here, I will also give some examples related to all Ranking functions in Microsoft SQL Server. 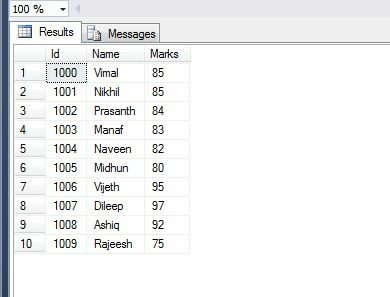 My table contains bulk amount of data and it’s related to student marks list. 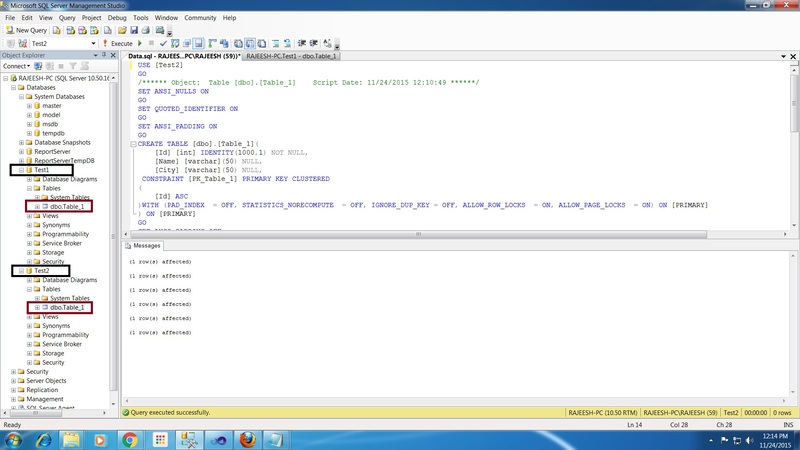 So, I am going to apply Microsoft SQL Server Ranking function in the following Table “Table_MarkList”. The following are the Ranking functions in Microsoft SQL Server. One of the important Ranking functions in Microsoft SQL Server is RANK(). Rank() Ranking functions are non deterministic and return a ranking value for each row in a partition. Some rows return same rank as other rows, depending on the same values in columns. The following result will be displayed after the RANK() function is applied in “Table_MarkList”. So, the RANK() function is sorting the mark’s column values in descending order, in the following table. The Rank() function will apply the same rank for common values in the table. 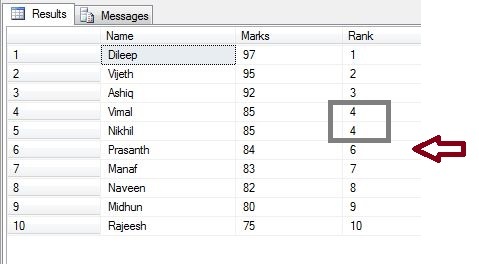 The following table contains the same marks for “Vimal” & “Nikhil” and after applying Rank() function, it shows both of them with the same rank as “4”. So, the next rank will show as “6” because internally it counts one 4 as 5. Another important Ranking function in Microsoft SQL Server is DENSE_RANK(). It differs from RANK() function and it also returns the same rank as other rows, depending on the same values in columns. If the same rank happens, then the next rank will be +1 added to the last rank. The DENSE_RANK() function sorts the Marks column values in descending order in the following table “Table_MarkList”. The DENSE_RANK() function will apply the same rank for common values in the table “Table_MarkList”. 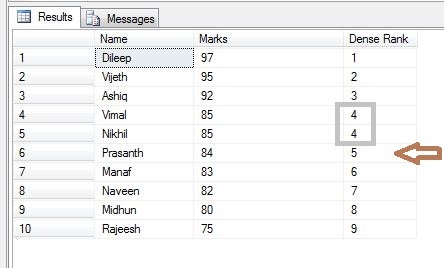 So, the following table contains same marks for “Vimal” & “Nikhil”, after applying DENSE_RANK() function, it has assigned these both the same rank as “4”. So, the next rank will start from “5”. It will maintain the rank order of the RANK() function. One of the important Ranking functions in Microsoft SQL Server is Row_Number(). We can use this Ranking function for pagination purposes. 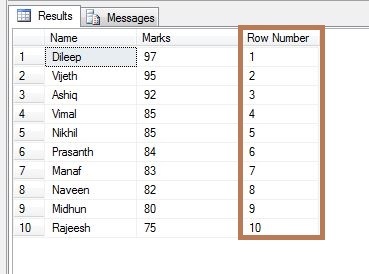 The Row_Number() function is sorting the Marks column values in descending order in the following table “Table_MarkList”. The Row_Number() function will apply the same rank for common values in the table “Table_MarkList”. 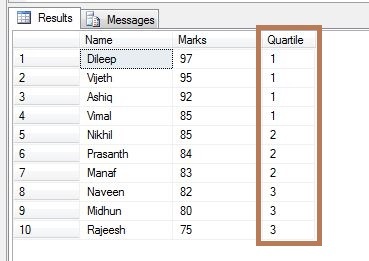 The following table contains the same marks for “Vimal” & “Nikhil”. After applying Row_Number() function, it is showing them both the rank as “4 & 5”. So, it gives the result as a sequence, one by one, and it never minds the common values in the “Marks” Column. Now the results are showing it accurately maintaining the Row Number in “Table_MarkList” table. The important Ranking function in Microsoft SQL Server is NTILE(). We can use this Ranking function for grouping purposes. NTILE(3) makes 3 groups and splits the number of row values in 3 equal groups. For example – If there are 9 row values in a table, it will split them into 3 equal row values in a table. Simple! But what will happen on 10 row values in NTILE(3) ?. It’s so simple. NTILE() will split them too in 3 groups but the first group will have 1 extra row value than the other row values in a table. We learned the types of Ranking functions in Microsoft SQL Server and I hope you liked this article. Please share your valuable suggestions and feedback. In this article you will learn how to copy or generate SQL database content to multiple one. Step 1: I have two database “Test1” & “Test2”. Test2 database is empty, so we want to copy Test1 database to Test2 based on your requirement like MS SQL Server 2008, 2012, etc. Click Tasks, then Generate Scripts. Step 3 : Click Next.. 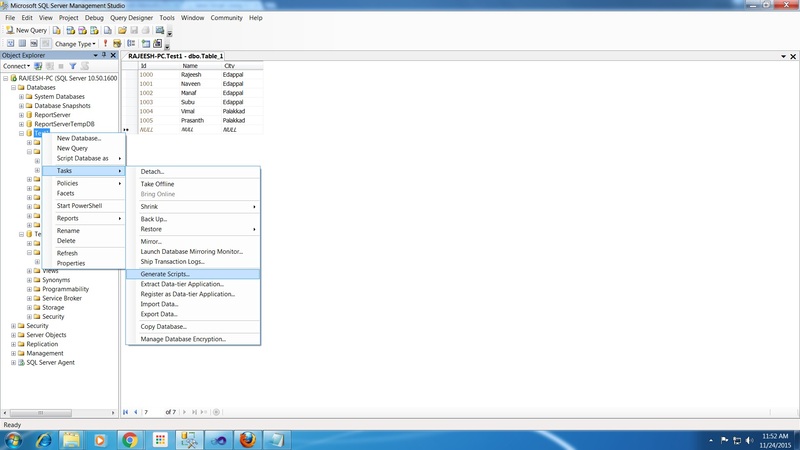 Step 4 : Select “Select specific database objects” and check all the tables present in the database. 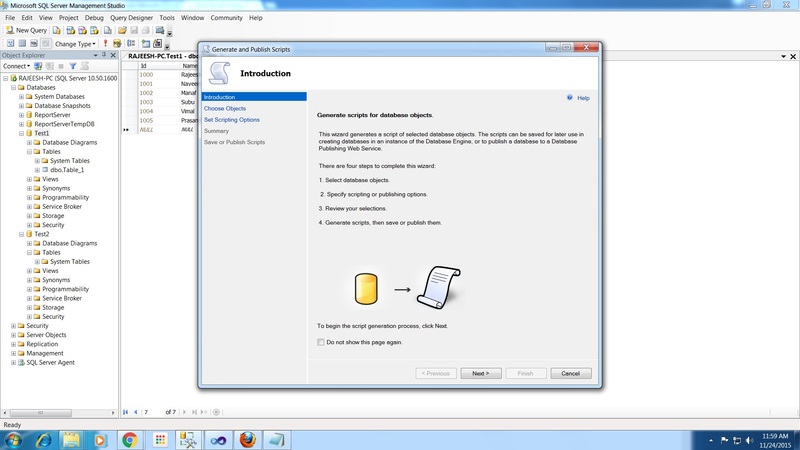 Step 5 : Click “Advanced“, Open New Pop Up Window, General, Script for Server Version, click SQL Server2008 R2 ( Select based on your requirement ). 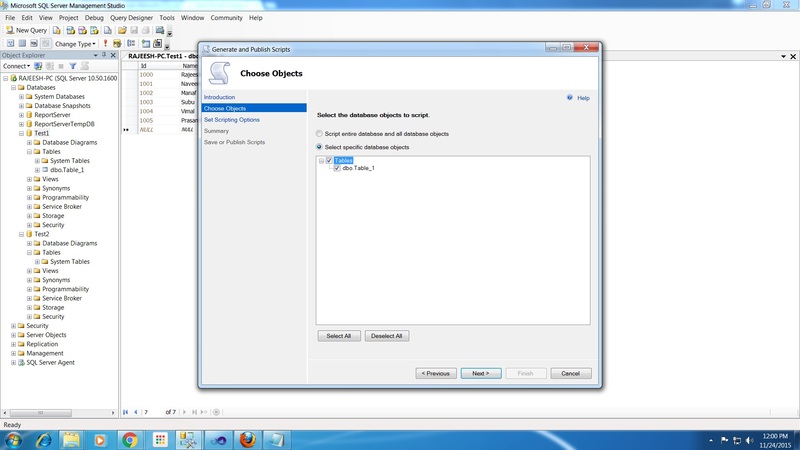 Step 6 : Click “Advanced“, Open New Pop Up Window, General, Types of data to script, then select Schema and data ( Select based on your requirement ). 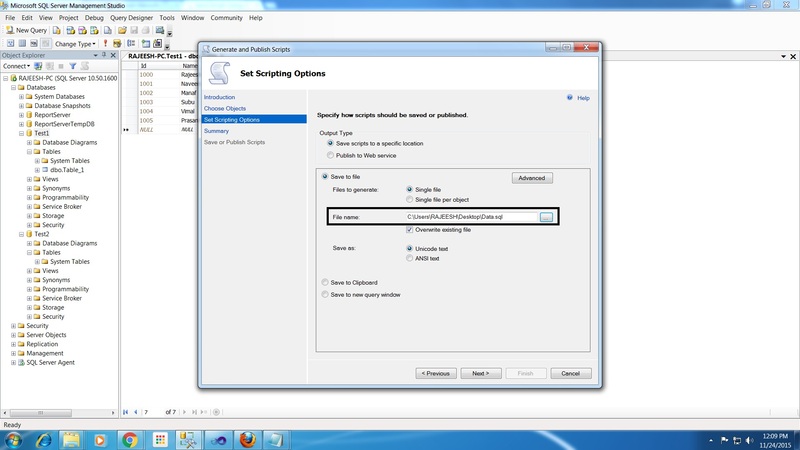 Step 7 : Select the save location for generated script. Step 8 : Click Next. Step 9 : Click Finish. 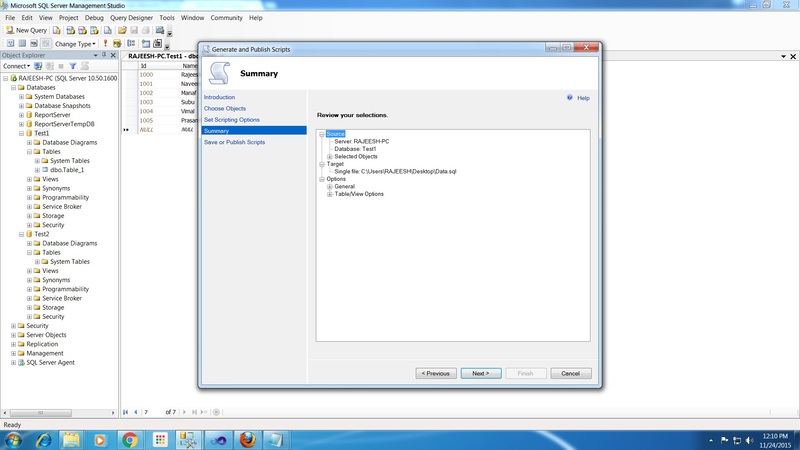 Step 10 : Change database name and update the generated scripts. Step 11 : Now copy “Test1” into “Test2”. 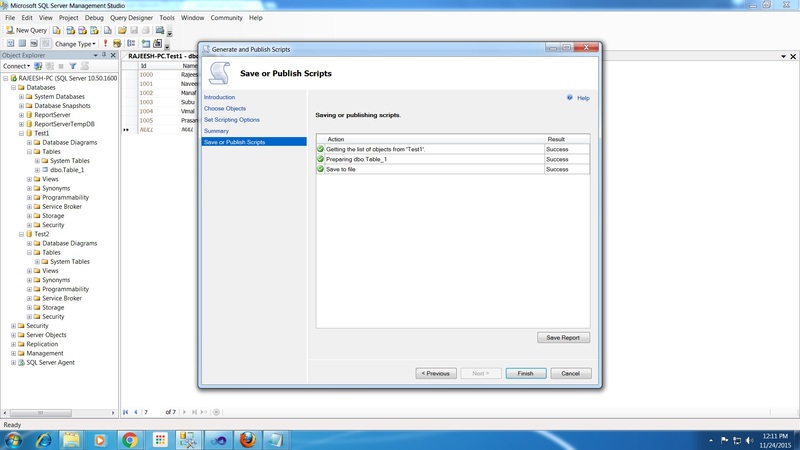 We learned how to copy or generate SQL database content to multiple one. I hope this article will be useful for beginners. 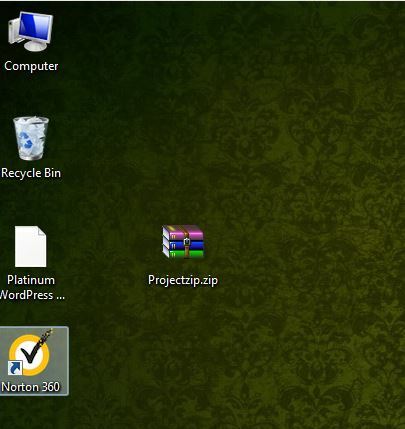 In this article I will explain how to create a zip file using ASP.Net & C#. In this purpose we can use Ionic.Zip.dll reference for creating Zip file in ASP.Net.So first we download the dll through this link Ionic.Zip.dll. After downloading the Ionic.Zip.dll Zip file you can get many folders inside the zip file. Go to zip-v1.9-Reduced folder Inside the zip file. then open the particular folder that contain Ionic.Zip.Reduced.dll. The following code will create zip file in ASP.Net with the help of Ionic.Zip.Reduced.dll. Code line number 03 describe the location of the file.Those files we can convert into zip format. Code line number 07 describe that the particular name of the file inside the zip file. Code line number 08 define the name of the zip file we are going to create. 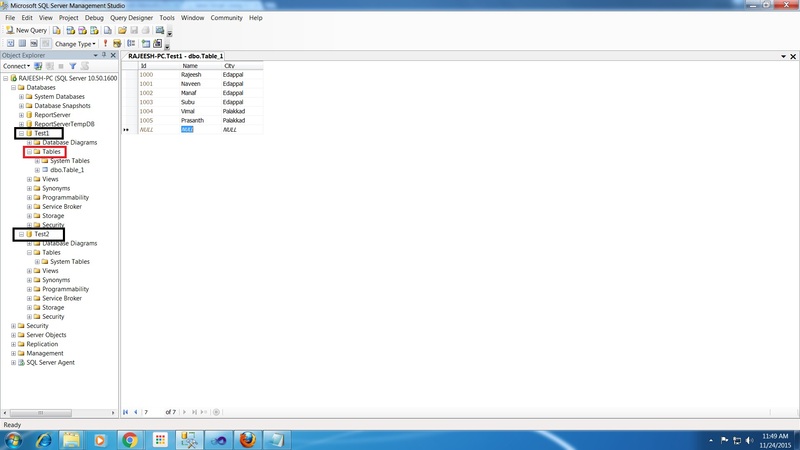 Add the Downloaded dll inside the Bin Folder. We learned how to create a Zip file using ASP.NET and C#. I hope this article is useful for all .NET beginners. 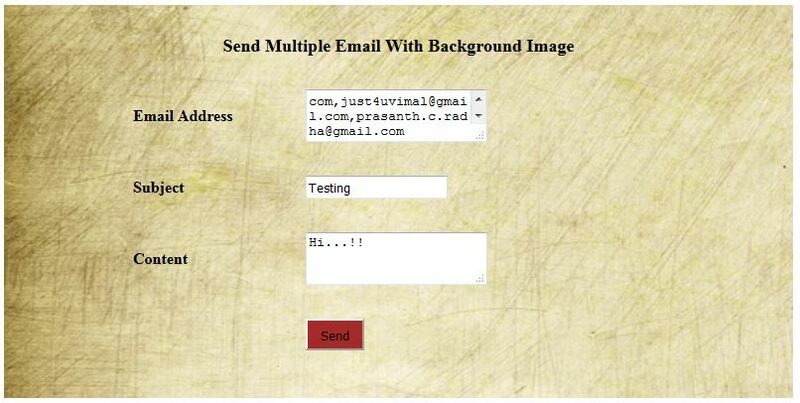 In this article I will explain how to send multiple emails with Inline Image. Before reading this article you must read my previous email related article because I have explained some basics part in my previous article and changed few of the code part in new one. The following are my previous articles. 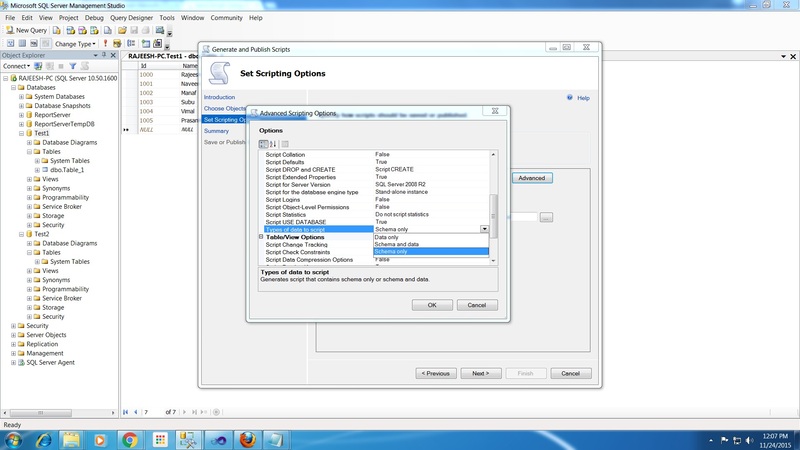 The following code will help to split the Comma ‘”,” separated email in the given textbox ( Txt_toaddress.Text ). The following code will help to fetch the image and set into the inline of the email body. Firstly, create one string that contain the html body with Inline image. In the above code “mailbody” is the string. It contains the html body. Create an AlternateView object for those supporting the HTML content. System.Net.Mime namespace contain the Image type and html format ( MediaTypeNames.Image.Jpeg & MediaTypeNames.Text.Html ). 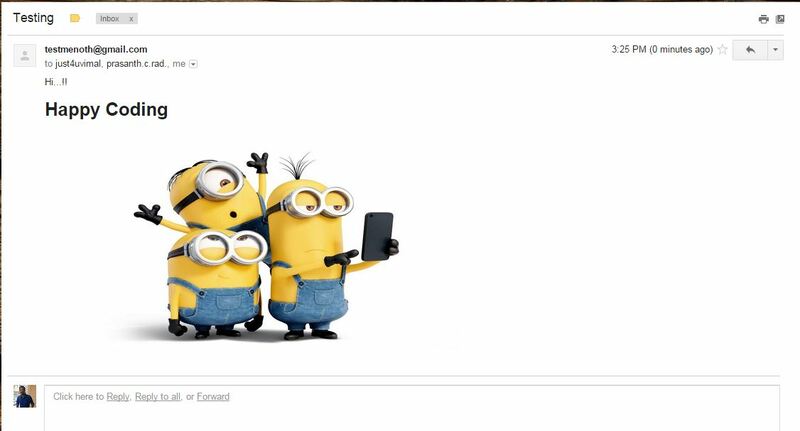 Create a LinkedResource object for the Inline image to send. Add a LinkedResource object to the AlternateView object. Check the correct Image location otherwise it will throw an error. Check the following reference to solve your 5.5.1 Authentication. We learned how to send multiple emails with Inline Image using ASP.NET and C#. I hope this article is useful for all .NET beginners. Mostly everyone is familiar with C# replace function. In this article I will explain the use of replace function in Microsoft SQL Server. A simple function to replace bulk amount of data in the database. Here I will also give some examples. My table contains bulk amount of data and some of the values are wrongly entered into the database. So I want to change those particular values into the table using a single query. The given table contains incorrect address in the “Address1” column like httpp://www.c-sharpcorner.com/, so http is appended with an extra p (“httpp“). So we can update those values in a single query. How ? 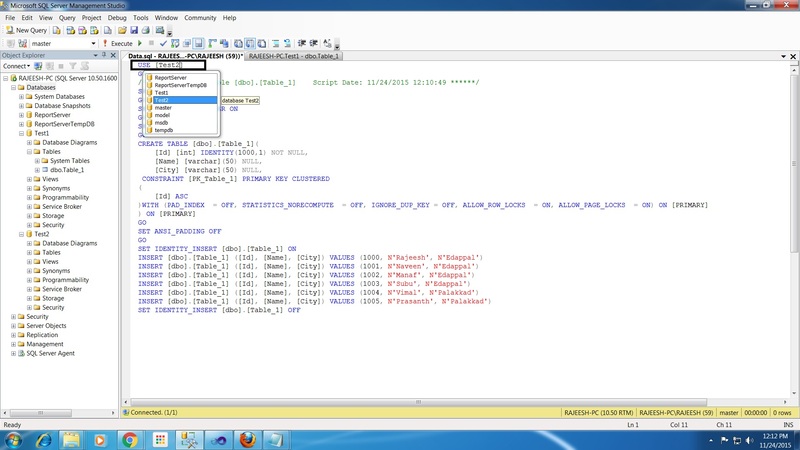 Microsoft SQL Server provides Replace function to replace particular data. The following code will replace that particular data. We can directly use the update method in the above query. Why we are using replace function in SQL? 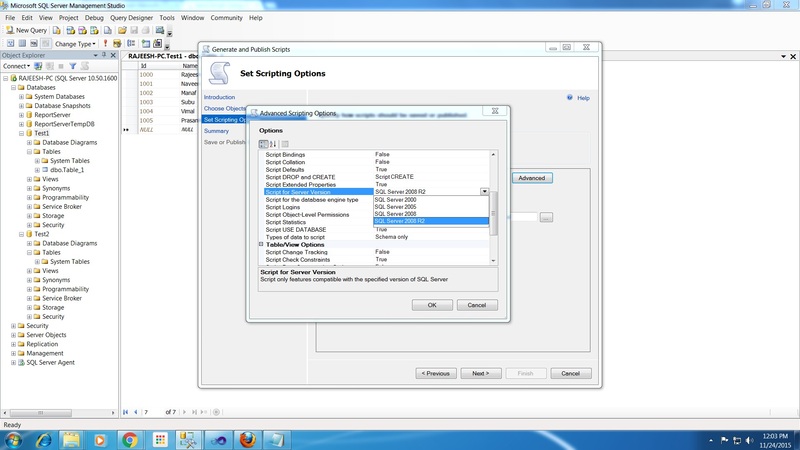 Because when you are trying to update bulk amount of data you can use the replace function. It will consume the time of update, since you don’t have to update each and every address separately. The above update code only changes the particular Id value. The Sql Replace function replacing “httpp” to “http”. The Replace function replaced the appended value using a single query. How to put space between “BlogContent” like “Blog Content” without affecting whole content in the database. We learned how to use a replace function in Microsoft Sql.I hope this article is useful for all .NET programmers.